Do you have any fun family traditions to mark the beginning of summer? For us, it is going to Sonic and getting a Cherry Limeade. Growing up, Sonic was very different than it is now. It used to be closed most of the year, only opening at about the start of May and closing sometime in September or October. They assumed that most people had no desire to sit in a drive through and get cold summer drinks. Crazy or what? Well, since it is what my husband and I both grew up with, neither of us even think of going to Sonic during the dead of winter and always go to get a Sonic Cherry Limeade as soon as the weather gets warmer. Unfortunately, the cost of this yummy drink has been creeping up through the years. I cringe when the ‘Happy Hour’ prices are more expensive than the old regular price. Yikes! While nothing really beats the full Sonic drive through experience, I started experimenting in my kitchen to make a fun copycat recipe. I mean, what is better than being able to have a yummy Sonic Cherry Limeade anytime you want it! Best of all, you can put in extra cherries or cherry juice, mixing it to your exact liking. After a bit of experimenting, we finally found the perfect recipe that is perfect mixture of sweetness to make even the hottest day seem amazing! 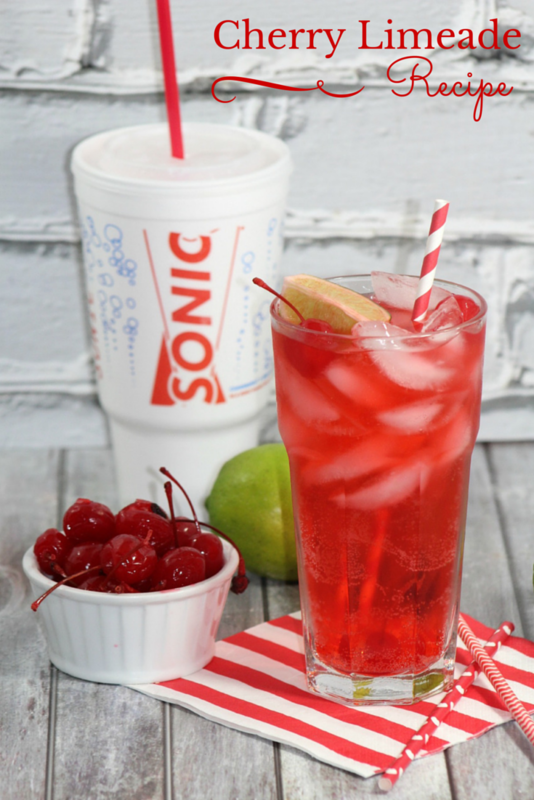 Feel free to try our yummy Sonic Cherry Limeade Copycat recipe and tell us what you think! Note: Special thanks to my friends Krista from Adventures of Country Divas for helping me with this recipe and pictures! Do you love Sonic's Cherry Limeade? Check out this delicious copycat recipe here! Fill your preferred pitcher with ice. Add your clear soda, grenadine and lime juice to the ice pitcher. With a long spatula or stirrer, mix the ingredients in the pitcher. Add cherries and lime wedges before serving for extra flavor! My daughter loves Sonic Cherry Limeade. She is going to love having this recipe. I can’t wait to try some out. I love Sonic and this drink looks so good. I love Cherry favored drinks. Thanks for this! There are no Sonics where I live, but I used to live out West, and I loved them. This is a super recipe! I love Sonics Cherry LImeade thanks for sharing!! I am having a party soon and I am gonna make this for sure! It sounds so refreshing! 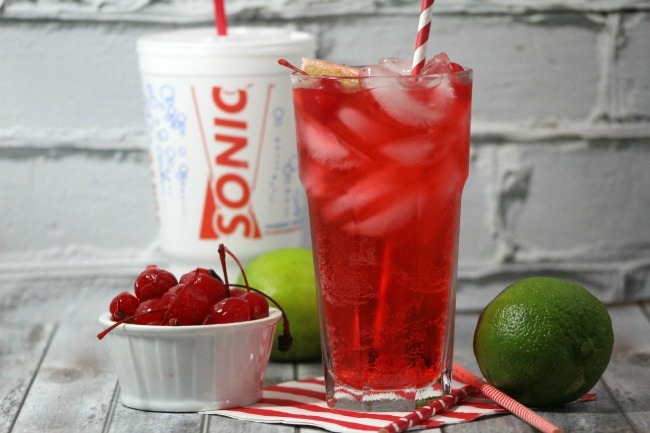 I have never been to a Sonic but I love this recipe for cherry-limeade. I am going to try to make it tonight! My son will love it!! There’s nothing better than a icy cold drink on a hot summer day. I’ve never been to Sonic.But, I’ll have to try this drink. Without the cherry flavoring. I LOVE cherry limeades from Sonic! And I’m super excited that I know I can make them at home…yay! Thanks for sharing the recipe. Its sure a plus for the summer. I love this recipe, thanks. We love Sonic but not one close to us so every time I go home I always make a trip there. I actually had the drink and it taste very delicious and refreshing. Great summer drink or for a BBQ you could actually get a recipe and make it yourself. I had to look up what Grenadine was because cherry-limeade is my absolute fav. Thanks for the recipe. I will sure be looking for Grenadine and purchasing so I can enjoy my favorite drink this summer. I love cherry limade! Thanks so much for the recipe. It is easier to make than I thought! My son wants to make this now. It looks awesome! I love this drink and love that I can make it at home. Thanks for the copycat recipe. It is so refreshing! I have never had Sonic’s Cherry Limeade but it does sound delicious. I can’t wait to try this, thank you for sharing this recipe. This sounds soo yummy! I will be saving this one for the “To try” folder! Thank you for posting! Yum! Definitely going to have to try this. I have got to try this out, for my sister! This is her absolute favorite drink when we go by there. I understand that actor Jamie Foxx is a big fan of the restaurant! This looks great! I can’t wait to try it. We love Sonic. This sounds like a great summer recipe. A big pitcher of this and some crushed ice – YUM! Omg thank you, this looks amazing. Perfect especially for the weather now. When I was younger, my favorite drink was the Sonic Cherry Limeade, and the Sonic Sunrise (Cherry Limeade with Orange Juice). I really appreciate you posting this recipe! Brings back lots of good memories! Looks yummy! Can’t wait to try this. These are so good year round, but especially refreshing in the summer. How nice to be able to make them at home. My 2nd favorite drink after good southern sweet tea! I’ll try this recipe since we no longer have a Sonic here! That looks so yummy. I am definitely going to try this. this is perfect for hot Florida days. ohh I love copy cat recipes! I have always wanted a copycat of a shirly temple! 🙂 these sound delish, don’t have a sonic near me. Oh, my kiddos are going to love this!!! This is one of my favorite drinks from Sonic. I sometimes get it in slushy form to which is really good. We love going to Sonic in the winter time. This is making me want this drink..lol. Thank you for the recipe, didn’t realize how easy it was to make! I love this drink from Sonic! I would love to make it at home. Thanks for posting! Cherry and Lime, all in one drink! It looks good and I truly think that it must be refreshing. Oh my! We love cherry limeades so I’m definitely going to try this! It would be a refreshing drink for this summer! I have found so many good copycat recipes on Pinterest. I also have two books by Todd Wilbur that have fast food copies. It’s pretty close. Oh, this sounds and looks good! I make a special trip to Sonic just for a Cherry Limeade at times. Yummy! I used to love getting these on hot summer days. Just the right refreshing drink to have. I haven’t had this in years and now I can make it. Seriously I am all about the lime. My family loves Sonic drinks. This one will be a great one to try with them. Thanks!